PE45388 SSMC jack right angle coaxial connector has an interface type of PE-047SR, PE-SR047AL, PE-SR047FL and a 50 Ohm impedance. Pasternack SSMC jack connector uses shield/contact solder/solder as an attachment method. Our jack SSMC right angle coaxial connector provides a minimum frequency of DC and a maximum frequency of 12.4 GHz. The Pasternack right angle SSMC jack coaxial connector has a teflon dielectric type. 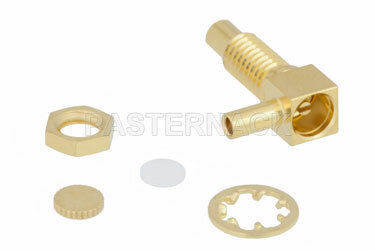 The Pasternack SSMC coaxial connector has a brass body with gold plating. 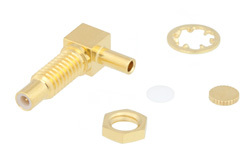 Our PE45388 SSMCright angle connector uses beryllium copper contact and a gold plating material. This SSMC jack right angle coaxial RF connector is RoHS and REACH compliant.